I ask the same questions to every contact lens wearer in my practice: Are your lenses comfortable? Do you sleep in them? How often do you throw them away? What solution do you use to clean the lenses? Nobody bats an eye by the first few questions. We all know that overwearing your contact lenses is a main source of discomfort, not to mention a dangerous health risk to the corneal tissue beneath your contact lens (see this post for more details). But when was the last time you stopped to think about how your contact lens solution made your contact lenses feel? Believe me, it can make all the difference in the world. Contact lens solutions are chemical cleaners designed to kill bacteria and remove protein and lipid debris from the surface of the lens. No surprise, not everyone reacts to these chemicals in the same way. I have patients that love generic solutions and never have a problem. I have patients that use the same solution every day for years, and then all of a sudden develop an allergy to the preservatives. It happens. The important thing is finding the solution that works with the chemistry of your natural eye and with that of your contact lens, and this is why talking with your doctor about any comfort issues can help find the solution that works bet for you. I prescribe generic medications all of the time, but I never recommend generic contact lens solutions as the best option for comfort. The reason? Generics are older formula concentrations that are high in preservative count and low in moisturizers. They will kill bacteria, so generics are not a health risk to your contact lenses. Preservatives are great at killing microorganisms, but they also are very toxic to your cornea. The higher the preservative count, the more drying, toxic chemical load your lenses are being coated in. Obviously not the most ideal for comfort. Contact lens solution hypersensitivity classically looks like this. 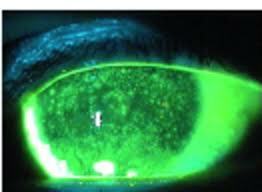 Your doctor will put a dye in the eye to visualize the patches of damaged corneal cells on the surface of the eye. It can take several days to weeks without contact lens wear and frequent lubricating drops to return the cornea to normal after a case like this. Classic signs of a contact lens solution sensitivity are burning or stinging when the lens touches your eye, blurry vision after rinsing the lenses, and general dryness, itching, or discomfort when wearing contact lenses. Your doctor will be able to evaluate if the solution, your contact lenses, or both are causing the problems with your comfort. -Brand new solution, but so far it has appeared to aid the transition for patients from a heavily moisturized 2 week lens to a more oxygen permeable monthly lens. If you are switching from a 2 week lens like Acuvue to a monthly product, I definitely recommend using a highly moisturizing, low preservative count contact lens solution. 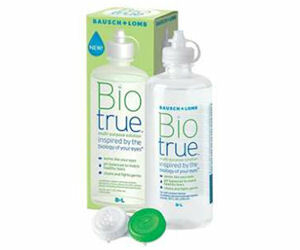 Biotrue (specifically formulated to match the natural pH of the eye for less stinging). Great with the Synergeyes Duette products! Clearcare works great for people with seasonal allergies, heavy depositing, and anyone with preservative sensitivity because it is preservative free! Dr. L: My personal fav for soft lenses - and I have tried them all! 1) BioTrue for daily cleaning or simply rinsing. The lenses have a truly soft feel after setting in this solution, and it does not irritate my eyes. 2) Sauflon One-Step - similar to Clear Care in type of solution, but, again, this leaves my lenses with a cushioned feel that surpasses Clear Care in my book. I use the Sauflon as often as needed (when I start to feel the edges of the lenses, or especially at the end of a very long wearing day, and it comes in a small travel size as well. Would love to have your opinion on this second option. I have never tried Sauflon, but like Clear Care it is a hydrogen peroxide cleaner with a major added bonus -- it has an extra moisturizing agent that Clear Care does not. 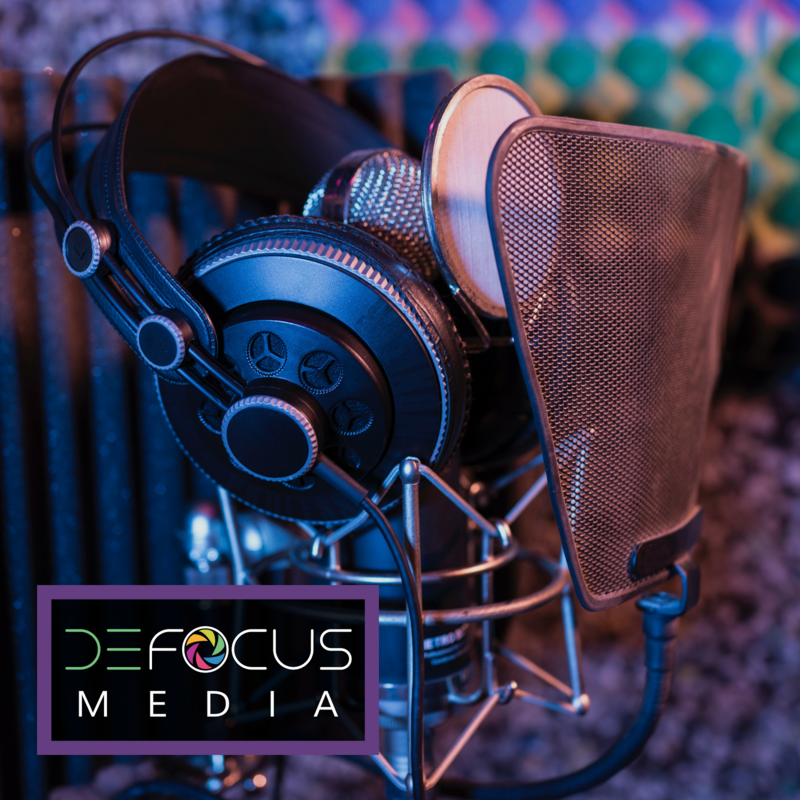 The drawback: it is only available to purchase through your doctor's office (and that is if they have an account) or from the company direct. Not sold in stores. 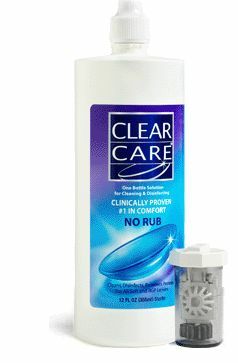 Clear Care on the other hand can be easily picked up at local pharmacies, grocery stores, etc. I use Walmart and Target brand hydrogen peroxide disinfectants. The cleaning agent in Clear Care irritates my eyes, while the cleaning agent (poloxymer) in the generics doesn’t bother my eyes at all. The Clear Care Hydraglyde version is even worse. It should be noted that Walmart and Target updated the placement of the platinum disc so neutralization does not start until the lenses are fully immersed into the peroxide. So not all generics are bad. Definitely not! It's just that you'll never know when Walmart or Target starts buying the Clear Care formula that you don't like, and suddenly you get the stinging from those solutions that you previously preferred. With generics they can change their formula at any time, to whoever is the lowest bidder, and they don't have to advertise or announce that they've changed. You won't know until it starts giving you problems.